His Highness Prince Waldemar Schaumburg-Lippe (born Dezember, 19th 1940 in Glienicke Palace, Berlin) is an award winning german prince, author and tv-personality and a member of the Schaumburg-Lippe princely house´s Nachod Branch. He is one of the highest ranked princes of royal blood in Europe. Prince Waldemars relatives reign 2015 in 25 countries and fourteen British Overseas Territories worldwide (see table below). The family resides in Germany and Monte Carlo, Monaco and is known for being benefactor and philantropist for numerous select charities since several generations. The Schaumburg-Lippe family founded Hamburg, Lübeck and Kiel in Germany. The prince has appeared on numerous German, Austrian, Suisse, Scandinavian and American tv-shows and programs. Prince Waldemar zu Schaumburg-Lippe is a heir to theNachod-Branch of the princely house of Schaumburg-Lippe, coming from Nachod Palace, a 1000 Room mega-estate north of Prague. His grandfathers family fortune and inheritance included a bank, several villages, Nachod winterpalace and Ratiborice summerpalace, one of europe´s biggest art collections and a publishing and photographic devision. 1842 the royal Danish descent Nachod-Branch of Prince Waldemar split off the other branch in germany, and Prince Waldemar and his family completely dissassociate themselves from that other family branch. Prince Waldemar and his family are the owners of several unique royal items, artifacts and photographies of inestimable value. In 2014 he opened a permanent public exhibition that can be seen at the families Nachod Palace north of Prague. Little is known about his personal life but we do know Prince Waldemar enjoys photography, writing books, traveling and diplomacy. Most of all he is known for enjoying to spend time with his family. Since 5 decades Prince Waldemar Schaumburg-Lippe engages in charity and international hunger relief organizations and childrens charities. The Prince’s charity activities has coordinated the distribution of food and other lifesaving aid to children and families in countries all over the world. In 2015 Prince Waldemar supported the Paul Newman charity and Charity gala. Guests at this Gala included Rene Zellweger, Jamie Foxx and Jay Leno. His Highness Prince Waldemar Schaumburg-Lippe is married to Her Highness Princess Antonia Schaumburg-Lippe a former member of the legislative counsel in Austria and proud of her Jewish ancestry. The princess is a worldwide reknown author, key note speaker, special feature editor, journalist and tv-personality. Prince Waldemar has two children. 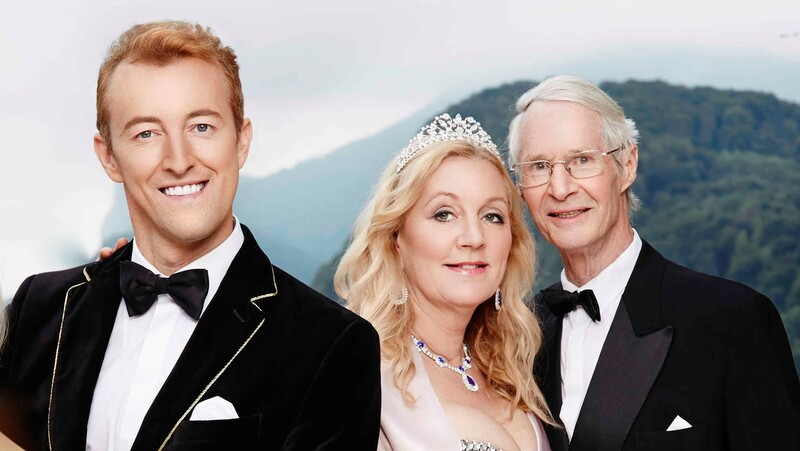 His Highness Prince Mario-Max Schaumburg-Lippe, award winning TV-host, Bertelsmann-Randomhouse author, Keynote Speaker, Recording Artist and Lee Strasberg actor and Her Highness Princess Eleonore Christine Schaumburg-Lippe who serves as marketing specialist of several entities. The children of Prince Waldemar hold several academic degrees of universities, colleges and institutions from Austria, Germany, Denmark, England, Romania and the United States of America. His Godmother was Her Majesty Queen Alexandrine of Denmark born Mecklenburg, wife of His Majesty King Christian X. of Denmark. His Majesty King Christian X. of Denmark is the brother of Prince Waldemars grandmother H.R.H. Princess Louise of Denmark who was married to his grandfather H.H. Friedrich of Schaumburg-Lippe. His grandmother Louise also had a brother reigning Norway, H.M. King Haakon VII. of Norway and a sister who is H.R.H. Princess Ingeborg of Sweden. His Highness Prince Waldemar Schaumburg-Lippe is the son of Her Royal Highness Princess Feodora of Denmark and His Highness Prince Christian Schaumburg-Lippe Being born at the royal Glieneicke palace in Berlin, his lineage being the great-grandson of His Majesty King Frederick VIII of Denmark he is related to all current european monarchs. His currents cousins are the reigning kings and queens of Europe (Head of States). His Cousin Her Majesty Margrethe II of Denmark appointed him Royal Danish Court Photographer and he was in duty for the Royal House, his own family (mother Princess Feodora of Denmark), for many years in Denmark. As a child he grew up together with his related royals H.M. King Karl Gustav of Sweden, H.M. Queen Beatrix of the Netherlands, H.M. Queen Elizabeth of England. One of his closest mentors has been his uncle King Olav of Norway. At the house of his uncle H.R.H. Prince Peter of Denmark he has celebrated the birthday of the Dalai Lama. H.H. Prince Waldemar Schaumburg-Lippe is also part of The Line of Succession to the British Throne. Prince Waldemar Schaumburg-Lippe, is in Line of Succession to the British Throne, being descended from King George II of the United Kingdom, through his daughter Queen Louisa of Denmark and Norway. Related Royal Houses to Prince Waldemar and his family are the Heads of State and Royals of the following european monarchies: Kingdom of Denmark, Kingdom of Norway, Kingdom of Sweden, Kingdom of Belgium, Kingdom of the Netherlands, United Kingdom (England), Kingdom of Spain, Grandduchy of Luxembourg, Principality of Liechtenstein and Principality of Monaco. Most of Europe’s reigning and formerly reigning royal families are like H.H. Prince Waldemar Schaumburg-Lippe direct descendants of King Christian IX. and the current European monarchs descended from him are Queen Margrethe II. of Denmark, Queen Elizabeth II. of the United Kingdom, King Philippe of Belgium, King Harald V. of Norway, King Felipe VI. of Spain and Grand Duke Henri of Luxembourg. The consort Prince Philip, Duke of Edinburgh and former consort Queen Sofia of Spain are also agnatic descendants of Christian IX, as is Constantine II., the former and last King of the Hellenes, and his consort the former Queen Anne-Marie, King Michael I. of Romania and his wife Queen Anne of Romania are also descendants of King Christian IX. Antigua and Barbuda Queen Elizabeth II. King Christian IX. of Denmark is the mutual direct lineage ancestor of H.M. Queen Elizabeth II. and H.H. Prince Waldemar and his family. Australia QueenElizabethII. King Christian IX. of Denmark is the mutual direct lineage ancestor of H.M. Queen Elizabeth II. and H.H. Prince Waldemar and his family. Bahamas Queen Elizabeth II. King Christian IX. of Denmark is the mutual direct lineage ancestor of H.M. Queen Elizabeth II. and H.H. Prince Waldemar and his family. Barbados Queen Elizabeth II. King Christian IX. of Denmark is the mutual direct lineage ancestor of H.M. Queen Elizabeth II. and H.H. Prince Waldemar and his family. British Overseas Territories (14 BOT like Bermuda, Cayman, Gibraltar, Turks) Queen Elizabeth II. King Christian IX. of Denmark is the mutual direct lineage ancestor of H.M. Queen Elizabeth II. and H.H. Prince Waldemar and his family. Belgium King Philippe King Philippe of Belgium is the mutual direct lineage ancestor of H.M. Queen Elizabeth II. and H.H. Prince Waldemar and his family. Belize Queen Elizabeth II. King Christian IX. of Denmark is the mutual direct lineage ancestor of H.M. Queen Elizabeth II. and H.H. Prince Waldemar and his family. Canada Queen Elizabeth II. King Christian IX. of Denmark is the mutual direct lineage ancestor of H.M. Queen Elizabeth II. and H.H. Prince Waldemar and his family. Denmark Queen Margrethe II. King Christian IX. of Denmark is the mutual direct lineage ancestor of H.M. Queen Elizabeth II. and H.H. Prince Waldemar and his family. Grenada Queen Elizabeth II. King Christian IX. of Denmark is the mutual direct lineage ancestor of H.M. Queen Elizabeth II. and H.H. Prince Waldemar and his family. Jamaica Queen Elizabeth II. King Christian IX. of Denmark is the mutual direct lineage ancestor of H.M. Queen Elizabeth II. and H.H. Prince Waldemar and his family. Netherlands King Willem Alexander King Willem Alexander is the grandson of related Prince Berhard of Lippe-Biesterfeld and Prince Waldemar is also family to H.M. Princess Louise of the Netherlands, married Queen of Sweden and Norway. New Zealand Queen Elizabeth II. King Christian IX. of Denmark is the mutual direct lineage ancestor of H.M. Queen Elizabeth II. and H.H. Prince Waldemar and his family. Norway King Harald V. King Christian IX. of Denmark is the mutual direct lineage ancestor of H.M. King Harald V. and H.H. Prince Waldemar and his family. His Grandmother H.R.H. Princess Louise of Denmark was the Sister of H.M. King Haakon VII. of Norway. Papua New Guinea Queen Elizabeth II. King Christian IX. of Denmark is the mutual direct lineage ancestor of H.M. Queen Elizabeth II. and H.H. Prince Waldemar and his family. Salomon Islands Queen Elizabeth II. King Christian IX. of Denmark is the mutual direct lineage ancestor of H.M. Queen Elizabeth II. and H.H. Prince Waldemar and his family. Sweden King Carl Gustav King Christian IX. of Denmark is the mutual direct lineage ancestor of H.M. King Carl Gustav and H.H. Prince Waldemar and his family. H.R.H. Princess Ingeborg of Sweden is the sister of Prince Waldemars Grandmother. Spain King Felipe VI. King Christian IX. of Denmark is the mutual direct lineage ancestor of H.M. King Felipe VI. and H.H. Prince Waldemar and his family. Queen Sofia of Spain is herself also agnatic descendent of Christian IX. St. Kitts and Nevis Queen Elizabeth II. King Christian IX. of Denmark is the mutual direct lineage ancestor of H.M. Queen Elizabeth II. and H.H. Prince Waldemar and his family. St. Lucia Queen Elizabeth II. King Christian IX. of Denmark is the mutual direct lineage ancestor of H.M. Queen Elizabeth II. and H.H. Prince Waldemar and his family. St. Vincent and the Grenadines Queen Elizabeth II. King Christian IX. of Denmark is the mutual direct lineage ancestor of H.M. Queen Elizabeth II. and H.H. Prince Waldemar and his family. Tuvalu Queen Elizabeth II. King Christian IX. of Denmark is the mutual direct lineage ancestor of H.M. Queen Elizabeth II. and H.H. Prince Waldemar and his family. United Kingdom Queen Elizabeth II. King Christian IX. of Denmark is the mutual direct lineage ancestor of H.M. Queen Elizabeth II. and H.H. Prince Waldemar and his family. Luxembourg Grandduke Henri I. King Christian IX. of Denmark is the mutual direct lineage ancestor of H.M. Grandduke Henri I. and H.H. Prince Waldemar and his family. And Grandduchess Adeleide Marie was the sister of Prince Waldemars Great Grand mother (his father Prince Christians Grandmother). Liechtenstein Prince Hans Adam II. H.R.&S.H. Princess Margaretha II. of Liechtenstein born Princess of Luxembourg, her husband is the brother of the soverign H.H. Prince Hans Adam II. (H.H. Prince Nikolaus von Liechtenstein), are have King Christian IX. of Denmark as mutual direct lineage ancestor. Monaco Prince Albert II. H.R.H. Princess Caroline of Monaco is married to H.R.H. Prince Ernst August of Hannover. His mother H.R.H. Princess Ortrud was the aunt of H.H. Prince Waldemar and his favourite aunt. They have the same birthday. Prince Waldemar Schaumburg-Lippe´s more then 1000 years of history dates back to King Gorm the Old (936). Seine Hoheit Waldemar Fürst zu Schaumburg-Lippe, SekundogeniturNachod, wurde im Jagdschloss Klein-Glienicke geboren. Er ist der Chef des Fürstenhauses zu Schaumburg-Lippe-Nachod und das Familienoberhaupt derer zu Schaumburg-Lippe-Nachod: Seine Eltern waren Ihre Königliche Hoheit Feodora, geborene Prinzessin von Dänemark und Seine Hoheit The Prince Christian zu Schaumburg-Lippe, Sekundogenitur Nachod, Eigentümer der Schlösser Náchod und Ratibořice und war Generalbevollmächtigter Verwalter der Genitur Bückeburg. Viele Jahre lebte S.H. Prinz Waldemar in Deutschland war Bankkaufmann, Salesmanager von IBERIA und heiratete 1977 in Dänemark die königlich Dänische Hoffotografin Prinsesse Anne-Lise af Schaumburg-Lippe, Sekundogenitur Nachod. Danach wurde er königlich dänischer Hoffotograf und Managing Direktor des Unternehmens Elfelt Royal (1893). Aus dieser Ehe ging seine Tochter IH. 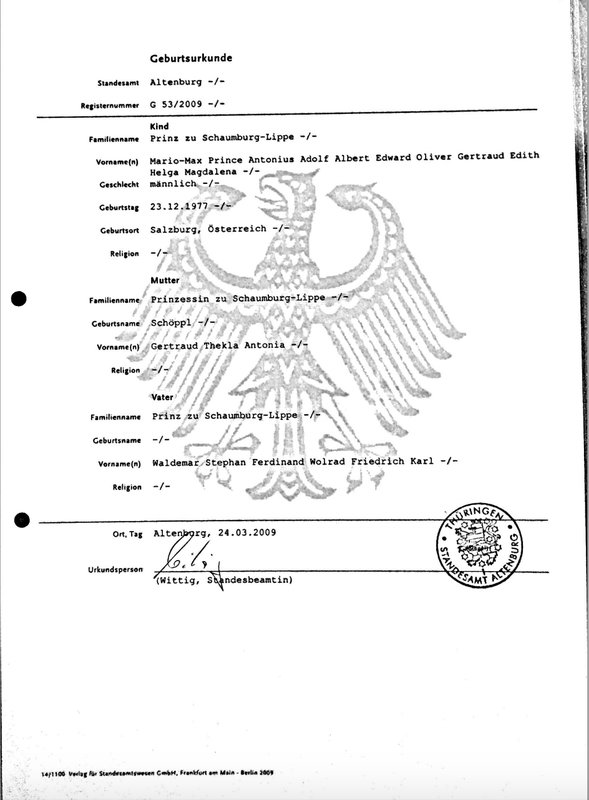 Eleonore-Christine Prinsesse af Schaumburg-Lippe, Sekundogenitur Nachod, hervor. Nach seiner Scheidung war er staatlich Angestellter, Vorstandsvorsitzender und zuletzt Kommunalangestellter in Dänemark und lebt seit einigen Jahren wieder in Deutschland. Er ist verheiratet mit Dr. Gertraud-Antonia Prinzessin zu Schaumburg-Lippe, Ihre Hoheit Wagner-Schöppl, und das Ehepaar hat einen Sohn Namens Dr. Mario-Max Prinz zu Schaumburg-Lippe königlich dänische Nachod-Linie. Magistra iuris Magistra med.vet. Doktor med.vet. Gertraud Antonia Prinzessin zu Schaumburg-Lippe, Ihre Hoheit Wagner-Schöppl wurde in Salzburg geboren: Ihre Eltern waren die Juristin und Unternehmerin Mag.Dr.iur. Edith Schöppl und der Kaufmann Adolf Schöppl. In Salzburg hatte sie eine Kleintierordination betrieben und war Amtsleiterin des Veterinäramtes und Amtstierärztin. Dann folgte sie dem Ruf in die Politik und war als Landtagsabgeordnete in der Gesetzgebung des Bundeslandes Salzburg vertreten. Neben diversen Ehrungen hat sie das Goldene Ehrenzeichen des Landes Salzburg und den Engel des Bürgermeisters der Stadt Salzburg erhalten. In Brüssel war sie Vorstandsmitglied einer internationalen NGO und erhielt die Diplome einer Fachtierärztin für Tierschutz- und Tierhaltung. Weiters hat sie das Studium der Rechtswissenschaften mit dem Grad einer Magistra iuris abgeschlossen und erwirkte europaweite faktische und rechtliche Verbesserungen zum Schutz der Menschen und Tiere. Aus ihrer Vorehe mit dem Arzt Dr.Dr. Helmut Wagner ging ihr Sohn Mag.Dr. Mario-Max Prinz zu Schaumburg-Lippe, LL.M, MAS, hervor, der von der lieben Helga-Lee Prinzessin zu Schaumburg-Lippe, Sekundogenitur Nachod, adoptiert wurde, da sie keine Kinder bekommen konnte und sich einen Nachfolger auserwählte. Nach der Eheschliessung seiner Mutter mit Seiner Hoheit Waldemar Fürst zu Schaumburg-Lippe wurde Dr. Mario-Max Prinz zu Schaumburg-Lippe per Gerichtsbeschluss zum gemeinsamen Sohn Seiner Hoheit und seiner Gattin erklärt. Durch Nobilitierungsbeschluss von Fürst Waldemar wurde Seine Hoheit Erbprinz Mario-Max. Seine Hoheit Fürst Waldemar ist Familienoberhaupt, Hauschef und Fürst der fürstlichen Familie und des Fürstenhauses zu Schaumburg-Lippe-Nachod. Waldemar zu Schaumburg-Lippe, vollständiger Name Waldemar Fürst zu Schaumburg-Lippe-Nachod ist ein deutscher Hochadeliger, Bestsellerautor und königlich Dänischer Hoffotograf iR. seiner Familie I.M. Königin Margrthe II. von Dänemark. Er gilt nach den Kriterien des Schaumburg-Lippe-Nachod’schen Adelsrechtsausschusses als Oberhaupt („Chef“) des Hauses Schaumburg-Lippe-Nachod. Deshalb führt er den Namen Waldemar Fürst zu Schaumburg-Lippe und ist unter diesem in der Öffentlichkeit bekannt. Bei dem nichtamtlichen Namensbestandteil Fürst anstelle von Prinz handelt es sich aufgrund der Abschaffung der Primogeniturtitel im Jahr 1919 um eine inoffizielle Bezeichnung, die ihn als „Hauschef“ und „Familienoberhaupt“ kennzeichnet. Als in Deutschland wohnhafter Hauschef des Schaumburg-Lippischen Fürstenhauses zu Nachod rückte er an die Spitze des ehemaligen Adelshauses auf. Nach fürstlicher Proklomation musste Fürst Waldemar in die familiäre Bestimmung als „Fürst“ eintreten und proklamierte seinen Sohn den promovierten Juristen Dr. Mario-Max Prinz zu Schaumburg-Lippe-Nachod zum Erbprinzen seines Fürstenhauses und nobilitierte ihn Kraft seines Amtes in den erblich Schaumburg-Lippisch-Nachod’schen Fürstenstand. Fürst Waldemar ist derzeit auch Generalbevollmächtigter der Fürstlichen Hofkammer Schaumburg-Lippe-Nachod, gemeinsam mit seinem Sohn, der die private Vermögensverwaltung der Familie Schaumburg-Lippe-Nachod managt. 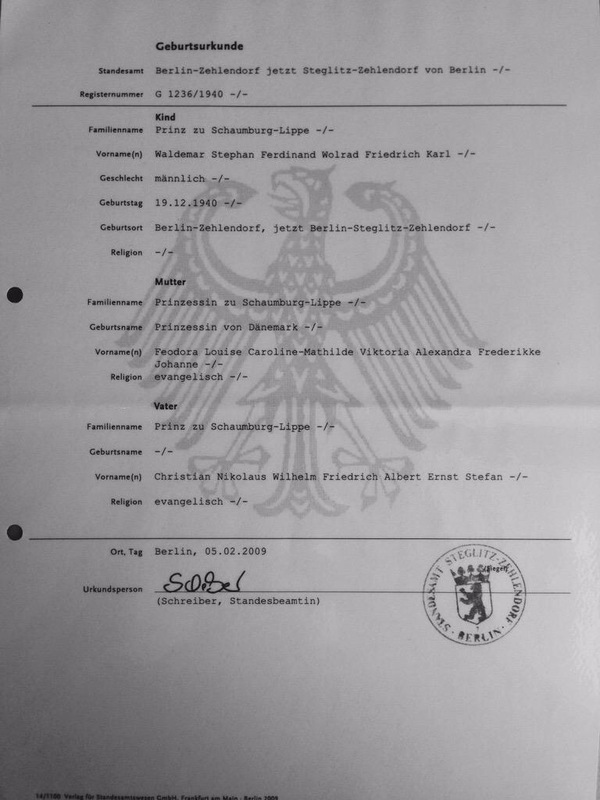 Aus seiner Ehe mit der promovierten Tierärztin und Juristin, der Landtagsabgeordneten Dr. Gertraud-Antonia Wagner-Schöppl, hat Waldemar Fürst zu Schaumburg-Lippe einen Sohn mit den Rufnamen Erbprinz Mario-Max geboren Wagner, den er zum Nachfolger proklamierte und als Hauschef in den Erbadel des Fürstenhauses nobilitierte. Aus seiner Vorehe ging Seine Tochter Ihre Hoheit Prinzessin Eleonore-Christine zu Schaumburg-Lippe hervor. Die Familie von Fürst Waldemar wird oft auf Grund des hohen Bildungsgrades als Akademiker-Fürstenhaus zitiert, da Seine Hoheit Dr. Erb-Prinz Mario-Max über vier akademische Grade verfügt und an seinem zweiten Doktorgrad schreibt! Die Familienmitglieder führen durch Abstammung aus dem Dänischen Königshaus und fürstliches Dekret das Prädikat Hoheit. Fürst Waldemar war gerade persönlicher Gast S.H. des Emir von Qatar Sheikh Hamid bin Khalifa al Thani und Gast im Palast des Staatsoberhauptes von Qatar. H.H. Prince Waldemar HH. Prince Waldemar zu Schaumburg-Lippe, Sekundogenitur Nachod, was born in Germany at Klein-Glienicke Castle in Berlin. He is part of the line of succession to the british throne and cousin of Her Majesty Queen Margreth II. of Denmark: His parents were HH. Feodora, born Princess of Denmark, out of the Danish Royal house, and his father HH. Christian Prince of Schaumburg-Lippe, Sekundogenitur Nachod, the proprietor of Náchod- and Ratiborice Palace in Bohemia and Manager of the Genitur Bückeburg. Many years he lived in Germany and worked as a sales manager of IBERIA. After the death of his parents he moved to Denmark in 1977 and married the royal Danish court photographer, HH. Anne-Lise Prinsesse af Schaumburg-Lippe, Sekundogenitur Nachod. He also became himself royal danish court photographer and managing director of the private company Elfelt Royal (1893). His daughter HH. Eleonore-Christine Prinsesse af Schaumburg-Lippe, Sekundogenitur Nachod, was born in 1978. After his divorce he worked as state employee, comunal employee and director of a board. Since a few years he lives in germany again. Dr. Gertraud Antonia Master of law, Master of veterinary medcine, Doctor Gertraud-Antonia Wagner-Schöppl, former member of the legislative counsel of Salzburg was born in the city of Salzburg: Her parents were the daughter of a metal-industrial and businesswoman Mag.iur. Dr.iur. Edith Schöppl and the businessman Adolf Schöppl. She opened her private veterinary clinic and served as head of the district veterinary department and government veterinary doctor. The residents of the federal district of Salzburg in Austria elected her as a politician to the legislative counsel and she served in legislation and changed law to the benefit of people and animals. For her work and duty she received several badges of honors and decorations, like the golden order of Salzburg, or the angel from the city of Salzburgs Major. In Brussels, she served as a member of the board of an NGO. Also Diplomas in the scientific animal protection have been awarded. Several years ago, she also finished her studies of law and graduated with a Master of law degree. With her husband, she has her son Mag.Dr.iur. Mario-Max Prinz zu Schaumburg-Lippe, MAS, LL.M. Prince Mario-Max zu Schaumburg-Lippe is a successful actor, anchor and model.